HotDamnTV: Even More Pictures of Clowns Juggalos and Soda Pop! Even More Pictures of Clowns Juggalos and Soda Pop! ICP has been celebrating Halloween night for the past 17 years by throwing a massive party in Detroit called Hallowicked. 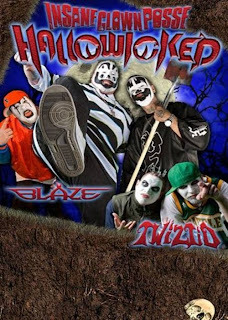 This coming October 31st marks the duo’s 18th Annual Hallowicked show, which promises to be super exciting with performances by ICP and their label mates Twiztid and Blaze Ya Dead Homie. Dancing Zombies + Insane Clowns + Musical Horror Stories Rapped Over Catchy Beats + Face Painted Juggalos Covered in Faygo + Most Entertaining Event on Halloween night = HALLOWICKED!!!! Hallowicked will take place at the Fillmore. The official Hallowicked after party will immediately follow at St. Andrews Hall, which will feature JCW matches and a performance by Wolfpac. We regard Hallowicked as a national event, as Juggalos from all over the US and Canada are always in attendance. This year we’re making Hallowicked available for Juggalos and media world wide! So, if you are not able to attend due to location the show will be broadcasted live via internet pay-per-view at www.psychopathiclive.com.